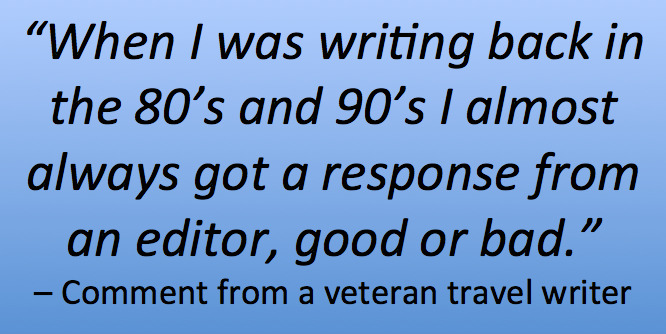 Magazine editors are the main customer of a freelance travel writer. “What I would like to see addressed by you is the increasing lack of response from editors of all types and stripes who simply do not respond one way or the other after you've produced a solid query and spent a good bit of time studying their writer guidelines and back issues. “I find this extremely frustrating, as I'm sure other writers do. I've been in the business more than 25 years, and it seems that today you are more likely to get NO response than a rejection. I'd much rather know the query was turned down so I can move on, than wonder if it even reached its destination. Unfortunately, this practice has become all too commonplace. I estimate that 80%--90% of magazine editors do not bother responding to query letters. A sad state of affairs, and one that shows an editor's lack of respect for the writers who make the effort to research and pitch them articles. This lack of professional courtesy has been the norm since I started writing in 2007. So I thought this was the norm, and didn’t let it bother me. (2) There's really nothing we can do about it. This is precisely why I suggest that you submit simultaneous submissions to as many magazines as you can amass on your magazine distribution lists. Freelance writing has been reduced to a numbers game; the more queries you send out, the more responses you'll get back. A sort of mass produced ‘shotgunning’ of queries is what it takes to be successful these days. In my experience, if an editor wants my story, he or she will usually respond within a few days to a week. After that, I assume the story is dead. But, I don't sit around and wait for a response from an editor. Today, I just keep sending out queries. 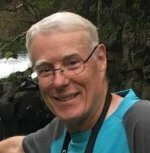 One of my big secrets is that I create lengthy magazine distribution lists for my queries -- anywhere from five to fifty listings, with fifteen to twenty-five being closer to average. When you’re sending queries to a large enough group of magazine editors, your story is more likely to get picked up. This is why 90% of my stories still get picked up somewhere around the world. 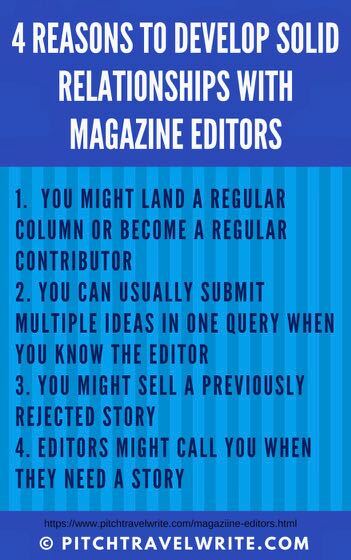 If you're only sending your queries to two to five magazines, for example, you might consider expanding your list. Also, are you including other English-speaking countries on your list? Adding international publications will expand your list. “Roy, that's helpful. I shouldn't be complaining about something that is commonplace and not something we, as writers, can do much about. “But I do think it's important to tell beginning writers that it's a new world today, with much less business etiquette than when I began sending out 30-50 queries a week back in the 80’s and 90’s. I almost always got a response, good or bad. The lack of response now is one of the reasons I left the magazine world and went on to write books and become a ghostwriter, a corporate writer, a website content writer, etc. 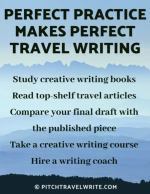 “Having said all that, I am dipping my pen back into travel writing as the perks can be worth (sometimes) the aggravation. I've heard this non-responsiveness referred to as "the silent no." But I still consider it poor manners, plain and simple. How long does it take to email a quick "thanks, but no thanks?" Only a few seconds. So I recommend that writers spend their time on maintaining a solid relationship with editors who do respond to your queries. These are the keepers, the real professionals. - You might land a regular series of columns that you write every month, and you can do it for a variety of magazines. Although this is the ideal, it doesn’t always work as smoothly as it sounds. Just when you have your regular columns chugging along nicely, a magazine will suddenly go out of business or change its editorial direction. That’s the reason to do this for more than one magazine at a time. - Once an editor knows you, you might be able to submit multiple story ideas in one query. A couple of years ago I had an experience where I submitted 6 story ideas to an editor, and got all 6 accepted. How did this happen? A fellow travel writer became an editor of a regional travel magazine. Because we were friends after meeting on a few press trips, I sent him a plethora of story ideas all at once. He nabbed the lot! Bliss! - You might get a previously rejected pitch accepted. This has happened to me where I’ve pitched stories that an editor has previously rejected and had them accepted, after I’ve established a rapport with him. - Editors might call you, asking you to write a story. Often they’re in a bind and need it quickly. In this situation, accept it immediately! Jump at it, even it means staying up all night and missing your favorite soap. Finally, just remember, the non-response issue is only one side of the coin. The other side is to make hay with the ‘responders’ - the responsive magazine editors. There are still plenty of these professionals out there. 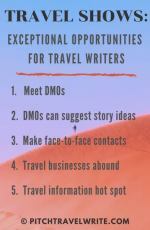 Your job as a travel writer is to find them, learn how you can help them, and nurture your relationship with them. 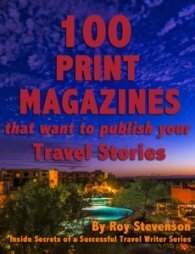 If you're wanting to get published in print media, 100 Print Magazines that Want to Publish Your Travel Stories gives you a ready-made a list of print magazines with contact details, writers guidelines, and much more.